Iâ€™ve always been a huge fan of UniVibes. That mysterious haunting tone made famous by Hendrix, Trower and Gilmour is simply irresistible. However, the UniVibeâ€™s large footprint is often a hassle for cramped pedal boards. The DryBell Vibe Machine promise to capture all the magic and lure of the classic tones with a few extras under the hood. All in a neat little box suitable for any pedal board. Hereâ€™s my review. To say that Iâ€™m a fan of UniVibes is perhaps an understatement. I love them and canâ€™t live without them. Machine Gun, Breathe, Bridge of Sighsâ€¦ It doesnâ€™t get any better that this. David Gilmour first started using UniVibes in early 1972 when Pink Floyd premiered and toured Eclipse â€“ the suite that would later evolve into Dark Side of the Moon. Years later, the circuit was customized into a rack unit still featured in Davidâ€™s rig. The Vibe Machine is housed in a MXR-sized box with true bypass switching and 9V Boss-style adapter power feed. A smaller sized design allows the same four photocells opto-system of the original UniVibe to be fitted into a neat little box. By carefully testing and measuring the physics of the system, DryBell has come up with a pedal thatâ€™s quite impressive and unique. The Vibe Machine is loaded with lots of cool features. It has two main controls for intensity, controlling the depth of the sweep, and speed. A mini toggle switch switches between vibrato and the more familiar chorus mode. A second toggle switch switches between bright and original mode. The original mode produces the same lo-fi throbbing sounds of the original UniVibe. The bright mode sets a higher input impedance, boosting the high mids and treble and creates a more dynamic tone that works especially well with low output single coils and large tone draining pedal boards. Located on the side of the pedal there are three trim pots allowing you to adjust the symetry, the range of the intensity control and the master volume (reduce up to 4dB). Thereâ€™s also a second input for expression pedal for controlling the speed just like on the original UniVibe. Any expression pedal will do (100 kOhm pot recommended). Inside the pedal there are two jumper switches. One switching between buffered or original Uni-Vibe output circuit and a second switch that sets the speed ramp for the expression pedal just like on a real Leslie. Iâ€™ve lost count over how many different UniVibes Iâ€™ve played over the years. Some of them are very true to the original while others offer something different with more or less success. I must admit that I was a bit skeptic when I first heard about the Vibe Machine. Yet another clone cramped into a small box that didnâ€™t live up to its name? Well, I was wrong. This is the real deal. Iâ€™ve always preferred brighter sounding UniVibes. It works best for my setup. However, the original mode sounds incredibly open and lush and blends nicely with overdrives and more aggressive distortions. The bright mode is my favourite though. With the intensity at about noon the Vibe Machine will produce those huge Hendrix tones even on the lowest amp volume levels. Add a bit of tube gain and youâ€™re on your way to Woodstock! As you can hear from the featured clip, the Vibe Machine also manages to stay focused and balanced even at the fastest speed rates. The Vibe Machine is definitely one of the better UniVibes Iâ€™ve played and with its smaller footprint it will be welcomed with cheering applause to my pedal board. 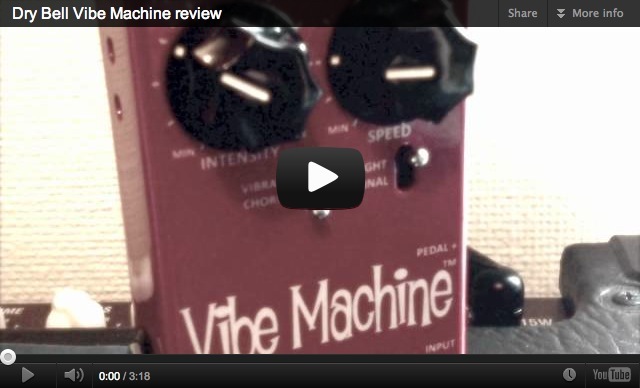 Whether you want Gilmour, Hendrix or just a great sounding vibe pedal, the Vibe Machine will deliver! Check out DryBell.Com for more details. The Vibe Machine was tested for both stage and home setups with a Reeves Custom 50 and a Laney L20 with both single coils and humbuckers. You’re probably sick of discussion and comments- but last night I suggested that the Vibemachine bumped the mid-range frequencies- and indeed IT DOES in the ORIGINAL position (without any pedals in front). The BRIGHT position does not add this mid-range hump, and is a neutral flat EQ. It’s similar to the Fulltone MDV3 pedal, where Vibemachine Original = Fulltone Vintage, and Vibemachine Bright=Fulltone Modern. This midrange hump drove me batty until I figured out what was going on. The Microvibe EQ is like Bright/Modern on these pedals, with a flat EQ. I don’t believe it boosts mids whatsoever, given my extensive testing and careful listening. I’ve used a Microvibe for years, and have LOVED it’s smooth warm Univibe tone. This week I bought the Vibemachine V2- and struggled for HOURS to get a similar tone to the Microvibe, which frankly I think is perfect- despite no expression pedal and limited fast speed (although I have a speed modded Microvibe). I finally discovered that the CHORUS trim has to be either fully clockwise or counterclockwise to get the depth and rubber band wateryness that the Microvibe naturally has. The OTHER thing, is that the Vibemachine has a most definite mid-range boost when engaged, between 500hz and 1.5Khz- this somewhat diminishes the warmth and resonance of the vibe effect, and makes it seem less “vibey” than the Microvibe- although, this mid-range hump may actually appeal to some, and allow the pedal to cut through mixes better. It took me HOURS to realize this EQ difference between the pedals but it is there- with an EQ pedal, I can make the EQ of the VIbemachine as flat as the Microvibe, and then the pedals sound exactly the same. I wasn’t happy with the Vibemachine V2 until I tweaked the CHORUS trimmer fully CCW- THEN it sounded as it should, and as good as my Microvibe, which I think is a STELLAR sounding Univibe, as inexpensive as it is, it sounds fantastic, way under appreciated. The Vibemachine has a lot more adjustments- from subtle to intense- than the Microvibe, however, as well as fine tweaks and the ability to use an expression pedal. Without adjusting the chorus trimmer, the default settings are rather lackluster- be forewarned. I think the new Grit trim pot and its interactive relationship with the output volume trim pot are alone worth a V2 review. Plus the detail and quality of your reviews has increased quite a bit in the past 6 years. Would love to see a revisit to the Drybell with the Vibe Machine V2. I just saw that and updated V2 version of the Vibe Machine has been released. What are your thoughts, and have you had a chance to use the pedal? I haven’t tried it yet but from what I can tell, they haven’t done much to the tone but packed it with all kinds of new features, including some interesting trim pots. Hello, great site. I came across your reviews while searching for a vibe pedal. My situation is unique in that I play through a high gain “metal” rig. I’m running a Mesa boogie roadster stack and a 5150 biamped setup. I play a lot of leads and I’d love to find a vibe pedal that would work with a high gain rig. I’ve tried the tube vibe, and the MDV-3 and neither was very good with my set up. Do you think the dry bell would be better? It seems the average vibe pedal isn’t designed to move a low heavy, high gain tone around very well. Also, my preferred pickups are the super distortion and the Duncan black winter. Both being high out put and rather dark. Hi Chris, based on what you write, I assume that you use the gain produced by the amp and not pedals. UniVibes tend to sound very bright and thin if you place them in front of the gain stage. Hendrix did that but he combined fuzz in front and a cranked amp behind, which works better. Placing a UniVibe in front of a heavily distorted pedal or amp, will sound pretty harsh. I’ve never tried to place a UniVibe in the amp’s effects loop – it might work, I don’t know. You might also want to check out a 4-stage vintage style phaser, like the script logo MXR Phase 90 or similar clones. This will sound warmer and it can easily double as a UniVibe. Do you have a recommendation between the Moon Vibe and Drybell for use with humbuckers? And thanks so much for what you have put into this site. It is a one-of-a kind resource and a real treasure. MoonVibe, I think. Both works nicely but the Machine Vibe tends to sound a tad thinner on humbuckers. I did purchase a Drybell Vibe Machine with your advice and once again it’s really great !!!! I integrated the Vibe machine start chain before Fuzz, Overdrive etc .. and I am delighted with the result, a transparant Vibe ringing hell !! I still have to explore its settings. Hi Bjorn! I have Vibe Machine and love it. I was thinking to buy Deja Vibe 2 just for testing but I think there’s no point. According Your review it’ll be just a waist of money and time I guess? I know it’s matter of taste but if Vibe Machine is brighter it’s obviously my choice. Hi Simo! As you can understand, I like the Vibe Machine over the Deja. Still, that’s not to say that the Deja sounds bad. It’s two different sounding UniVibes. The Deja has a more vintage lo-fi flavour, while the Machine has a slightly more transparent character and more presence. Again, my opinion, but of the more vintage sounding Vibes I’d go for the MJM 60s Vibe or the excellent Moon Vibe from Electronic Orange. Cheers! Hi Denis! Yep, Effektpedaler is a great store! Been there many times and going back on my vacation later this summer :) Cheers! Hi Felipe! I haven’t noticed any noise from mine but some of the clips I’ve seen have some 60 cycle hum, which doesn’t come from the pedal. All UniVibes has that low frequency throb but lowering the intensity, when you have higher speed settings, will even it out. Just wanted to know your opinion on Fulltone’s newest Mini-DÃ©jÃ Vibe (the blue one). I haven’t heard too much about it and I’m wondering how it compares to the Vibe Machine. Thanks Bjorn for you answer! I thinks it help me!! effectrode tube-vibe or this drybell vibe machine? Hey Bjorn, Hendrix’s Uni-vibe didn’t seem to sound too bad when he played the Star Spangled Banner at Woodstock. But was it high gain, or ludicrous volume? If it was gain, it sounded great with a uni-vibe, but his volume was so loud, it doesn’t take a great deal of gain to get that huge sound. What do you think? I went back to basics, my amp treble and bass knobs got moved. I adjusted my whole rig and now sounds sweet. Thanks for helping me out. I’m know ready to Rock! Love your reviews and airbag is the best, looking forward to your solo album. I just got the drybell two weeks ago and I’m not really happy with it. It’s prob cause I don’t know how or when to use it properly(caused I never owned one). I play through a fender 65 Princeton reissue. My pedal board is vibe machine, musket, keeleyBD2, Mooer elec mis, tc electronic delay, carbon copy, tuner, amp. It seems when I play with the vibe there is allot of clarity that is lost, even with the brite switch on and I’m on chorus, When I switch it to Vibrato it sounds allot better and clearer except I want to use it with the chorus. I bought this instead of the small stone nano and I borrowed my friends and it sounds great with my set up. Could you please give me some recommendations of what I might be doing wrong. Have you tried the FoxRox AquaVibe? I have arrived to a decision between the AquaVibe and the Vibe Machine. They both seem to have the most open sound of every UniVibe pedal I have listened to on youtube. And there is a good comparison of the AquaVibe vs the Fulltone DejaVibe. If it is coming down to input impedance and output impedance I could try a cheaper unit and just use buffers. However, I do like the adjustability of these two units. Very helpful review. I’m looking to replace my Fulltone MDV-2 (the one with the built in treadle) because it gives very nasty distortion when I play harder through humbuckers (I use 70s SGs mostly). I’ve looked at a bunch of vibe pedals and many of them sound great, but I’m afraid that they may all have this problem to some degree. It looks like you are mostly a Strat player but have you had this problem with any of the vibe pedals you have used, or specifically with the Vibe Machine? I forgot to ask if you changed the stock settings for the symetry and range controls on the side of the VM, if so what are they now? Also could you describe what exactly each of them do? Is it worth messing around with them or they are fixed in the best setting. Thanks again, really appreciate your answers! Thanks for the recommendation, i finally pulled the trigger on the Dry Bell, got in last night! I’ve trying to get a nice mild tone with it but whith my neck and middle position pickups the sound is very muffled and undefined. I can’ t seem to dial in the right settings. What could be the problem? Also could you share some settings that you are curretly using? takes all TPS Exp pedals from 10-250k linear pots. Great job whith the review, very helpfull. I’m finally getting a univibe pedal and wanted to know your opinion on which would you recomend between the vibe machine and moon vibe mkii putting the size out of the equation, since i play classic rock gilmour, hendrix etc. My rig is a us amr vintage 57 strat through a hot rod deville 212 with vintage 30 and g12h30 speakers. Thnks!! Curious if you have ever tried the FoxRox Aquavibe and how you’d compare it to the Vibe Machine? Hello again Bjorn, after all I’ve sanid about the Vibe Machine, I’ve found an issue that is food for thought. Despite the fact that in my opinion, that the Drybell is likely the finest, and definitely the smallest “real” UniVibe made, the one thing that was my absolute necessity has become a serious issue. The speed pedal connection on the pedal is a TPS, or stereo, tip, ring, sleeve connection, and is set up for a 100k expression pedal. Only problem is, there are very, very few 100k expression pedals, and as far as I can tell only one with TRS! And, as nice as the folks at drybell are,( they’ve answered every question fully, and generally within 30 minutes of sending them an email! ), They sell that one TRS 100k expression pedal, The Mission EP 100k, it comes in several colors, including DryBell Red, and looks absolutely bulletproof! But, the pedal is $144.00 US! That brings the $320.00 for the pedal,( reasonable for any great optical vibe! ), to a total of $464.00 US, excluding the TRS cable of course. While that gives me pause about buying a pedal I really want, they are kind enough to give you two cheaper alternatives, though both require a y cable to work the TRS configuration. They also give you detailed instructions on their online manual on how to convert the very inexpensive old used Crybaby, because of it’s RocPotz 100k pot the crybaby comes stock with. While this conundrum doesn’t totally change my mind about buying the vibe I feel likely the best made,( this belief is due to the company’s idea of maki.g only modulation pedals, and perfecting the first, before moving on, this has been 6 years, at this point!). So, since you have the pedal, do you use a speed treadle, and if so, did they also provide the EP 100k? If not, do you know of a pedal that sells for maybe half the cost of the suggested Mission EP 100k? I’m so disappointed that after waiting this long, because of reading about the new photocells, and matching process, wanting an even better pedal, which it’s claimed to have much more low end throb, I run into $144.00 accessorie, and a cord that probably would be another $30-$40 bucks. If I had room for a Moonvibe MkII, I’d likely order it right now, and deal with trying to turn a knob with my foot! Hey Bjorn, I tried to post this info twice this morning, maybe I’m over my limit! The link to the info about the new photocells is below, hope it works! Hi Bjorn, how are you? Do you have some tips about an easy to find expression pedal to be used along with the “vibe machine”? Thanks! Best Regards. MIM Strat w/humbucker (all stock pickups)>Sunface bc183>OCD>Vibe Machine>Fender Blues jr.
Running clean the VM sounds awesome, and through the OCD it sounds pretty good, but through the sunface it sounds terribly thin and fuzzy. Reversing the combo just made it sound bad in a whole different way. I know you said it can be thin with bright sounding amps so I lowered the treble and boosted the mids but it was no use. I am playing at very low bedroom levels, but if its one person who can help, its you. I will be using it mostly for clean stuff, but I want to be able to do crazy vibe fuzz as well. Thanks for the sight and all the hard work you put into it. It really shows! I’ve boght an EHX “The Wiggler” 2 tube vibrato/tremolo pedal. As any “tube pedal”, its very difficult to find a “correct” configuration through its enumerou knobs. And this EHX specific pedal deals with so much hum. This Dry Bell Vib Machine, as a UniVibe clone, seems to be more easy to deal with. Bjorn, will you post some vÃ­deos where YOU appear playing some Pink Floyd songs testing this Dry Bell Vibe Machine? For me, your vÃ­deos reflect a “real testing” for this kind of gadget. Best Regards! But i just saw your new review, maybe that is the way. My best wishes from Chile. Just when I decided to buy this pedal had saved the money, unfortunately the pedal may not be declared by a lower value(making me imposible to acquire, thanks customs). It really seemed like a very nice piece to add to any pedalboard. So sad, maybe i need to go for the throbak overdrive. Apples and oranges but really seems the best In their funtion. I wonder how it is compared to my Tube-Vibe. More authentic? Have you tried the effectrode? First of all, thanks for all the wonderful info and amazing reviews. Have you ever tried this pedal http://www.fuzzbox.com/vibe-unit. Sounds promising for some Gilmourizing! Greetings from Costa Rica. Yes, it looks like a very interesting Vibe, although I have to say that while I haven’t tried the Jam pedals Retro Vibe , the jetcity youtube clip of that pedal sounds the best to my ears, especially for that Hendrix sound. Again interesting ,mouth watering review till you gt to the price, scary if your just playing in your bedroom. can you produce this tone with a phaser, chorus and delay,or is that to complicated. how about the soul vibe or the anniversary release of the Dunlop Jimi Hendrix pedal. Is there maybe a cheap version that approachs these sounds, the Danelectro chicken salad, or vibe pedals are supposed to sound like univibes, but not to my ears. Been using my Vibe Machine regularily since March and absolutely love it. Gonna stay on my board for a long time I’m sure. In response to the comment about volume, there’s a trimpot for that so you can either boost it a little or just keep it at unity. As far as the bass frequencies go, yeah I had some issues with that as well but playing around with the trimpots a bit took care of that (make sure you photograph or mark the original settings first though if you want to go back). Not overly ecstatic about the buffer, but other than that it’s pretty much the Chuck Norris of vibe pedals as far as I’m concerned. Have a quick question though as I am not so familiar with the UniVibe: past halfway on the intensity knob, I can hear bass frequencies being produced at the rate set up with the Speed knob, even when no input… Pretty similar to a heartbeat actually. Is it normal and part of the vibe design? Thanks for all your nice reviews, it is really helping narrowing our choices and discovering new products. all are analog..the fuzz is a bc108 silicon, like the mxr 108 / buffer or the hendrix fuzz..dsotm sounds! !…i reckon the u-vibe is one photocell (like the danelectro or voodoo lab) worth the shot to try em cheers!!! What is the signal chain you are using the viddy? this should not be a kind of advertising – i am not related with mr. blackman in any way. Well Bjorn I have an update, they caught the guy who stole my strat and busted my window out but alas the guitar is gone… My insurance is paying for the window but told me they will only pay for the amount of the orignal guitar, not the dg20 emgs and the 7.25 nitrocellulose vintage neck so im out a total of 500$, but atleast ill beable to buy another strat with the 499$ theyre giving me for the guitar. I just dont understand why they wont cover the cost for the upgrades I made…well anyways thanks for the kind words Bjorn and soon ill be replacing my vox with either a Hiwatt clone or a Reeves once ive replaced the guitar+pickups+neck. Oh and my bd2 keely finally got here and you were right it really is a great transparent booster for my Musket, and an amazing od! I couldnt be happier with the combo, cant wait to hear em with the DG20s! Thanks a ton for all the advice, if not for all your hard work with Gilmourish I wouldn’t have known about all the amazing gear youve reviewed. Hi folks, I went and got 3 new JJ preamp tubes, which in itself is a bit confusing. The JJ marked 12AX7 on the label, and the tube, is marked ecc83 s on the end panel of the box. They are eveidently the same tube, but I also found that the offending tube, which caused the problem in the first place was a Ruby 12AX7, which is also a JJecc83 s. The TSA’s with two preamp tubes, the 15h, and 15 combo, have two Electa output tubes, and two 12AX7’s marked only with the tube3, and made in China, while the 30 has the chinese pres in 1 & 2, and the Ruby/JJ 12AX7/ecc83 in posistion 3, which like I said is the tube that is after the EQs, while the cheapos are in the two right after the input. When reading about tubes, it says the JJ ecc83 s/ 12AX7XXX is a great high gain tube, and is a great tube for Marshalls, and Heavy Metal, but I think this is the tube you use Bjorn? I notice that even with the pronounced hiss/hum, changing the tubes in the 30 to all JJ’s, I can now get more cklean headroom, and I don’t notice a volume drop, but alas the hiss/hum is unbearable, and the amp is definitely on it’s way to New Jersey for God knows how long. As much money as I’ve spent at Sam Ash this year, and the fact that both amps have had tube issues, and now thios, within the first 20 hours of playing time, and the fact that it was a bit misleading that the 15 has chasis mounted sockets, and the 30 PCB mounted sockets, I am going to at least try to get a new amp out of them, or my money back. I’ve had it less than six months, and rarly have used it, becuse the 15 is loud enough at home. Onnce again, just venting, but it is a bit depressing to find an amp that does everything you want, only to be hassled by this issue. It all started when I heard a very loud honk when I turned it on, and the bad tube was then replaced, but the hiss was there even though that very scary honk was gone. I have heard that honk before, When My Early 80’s 100 watt Laney Lead Pro Died! So The fcat it even still works, is at least somewhat encouraging! Peace , Love, And God I hope I get this straight quickly! Didn’t know where to post this, so I figured this would be the first thing seen. Yesterday I stopped by tom’s shop to see how close my Strat was to being finished. While ther, I mentioned i was going to stop at Sam Ash to pick up 2 new 12AX7’s for the TSA30, but Tom said he had them, and would give them to me at cost, which is $9.00, instead of $14.00. He only had two JJ ecc83 s’, and a Sovtek 12AX7, and I took them, and after installing them, the amp made a really loud, and awful sound. I had put the Sovtek, in position 3, which is the only preamp tube after the EQ, the other two are right after the input, before it gets to the EQ, and output section. I decided to try that one first, it being the odd man out, and replaced it with the original chinese tube. The amp is now working, but it now has a pronouced hiss, even if nothing is plugged in. it is quiet with the master volume down, but the louder the master, the louder the hiss. I am going to go buy 3 new JJ 12 AX 7, or ecc83s, and see what happens, but I think the amp is going to the shop! Any ideas Stephen Ford? Ibanez has a 5 year warranty, and I called them before I replaced the tubes on the 15, just to make sure it wouldn’t affect the warranty, but I feel a little ripped off. The 15H has chasis mounted tube sockets, and so I assumed the 30 did too, but I found out yesterday that they are PCB mounted, and while many amps are that way these days, it still scares me. I hope the noise is a tube, but I think that bad Sovtek did something very bad, or the PCB mouted sockets are already an issue, and one of them moved, and is grounding on something. This is mostly venting, but if anyone has an idea about what occured, I’d appreciate your comments. Thanks Bjorn, the new fonts in this comment area are much easier on my old eyes! Thanks for the tip with the bd2, im really looking forward to playing with it but im going to have to use my Ibanez RG350dx now because my Fender FSR strat was stolen out of my car today, hopefully the police can catch whoever busted my window out and took my strat that I saved and saved up money by eating nothing but ramen noodles for 3 months to buy with a dg20 set with it. I mean who would be low enoufh to steal the guitar ive allways dreamed about, hoped for, and wanted sence I was a kid? Im sorry for cluttering up the thread Bjorn, im just really sad because my Gilmour inspired strat is probally gone forever. So to all my other Gilmour fans and Gilmourish.com community never take your eyes off your gear for a second, take your guitar into the store with you like I should have. Once again Bjorn im sorry for messing up your thread but I just needed to vent. Thanks for everything Bjorn, Gilmourish.com has been my #1 website for a long time, without it I’d never have learned so much, and gotten inspired again to keep playing because with your help i finally got the tone I wanted but couldn’t quite get. Great version of Any Colour You Like Bjorn! I have allways loved that tone, its allways been a goal of mine to get that sweet funky sound so I guess after my keely bd2 gets here ill have to save up for one of these. Did you try the expression pedal with this or did you just use the controlls on the pedal? Also how dose this pedal interact with overdrives like the bd2 and distortions like the Musket? Any problems using a muff with it on a mild setting? Thanks a ton for all the time and effort you put into keeping all of us Gilmour tone freaks up to date on the best quality gear. great pedal, pricey pricey pricey though!! what about the univibe from dunlop (not the stereo) or the Voodoo Lab Micro Vibe? there are tons of vibes out in the market for less…the BBE is another option though i dunno if got the four photocells like the Voodoo Lab. Lovely demo – I would take a serious look at this if I had not just bought a Tech 21 Rotochoir to help with my DSotM Tones. I would also like to know your opinion of the TC Electronic Vortex Flanger for those Wall tones as compared to the EHEM that is. Hey Bjorn, hope you’re doing great! Thanks again for sharing! I was looking for a univibe so the timing is great! How would you compare this one with the Moon-vibe? From the clips I heard so far the Moon-vibe seemed a little better? Which one would you pick if you had only one choice? Great review as always – thank you very much! As you have reviewed the Electronic Orange Moon Vibe a couple of months ago, I am now pretty unsure which one to choose. Could you please let me know which one you prefer and which one may sound closest to the originial? Both are great units -actually I had alreadey decided to choose the Electronic Orange Moon Vibe, but they will come out with a version later this year, so I have not yet ordered. And now there is obviously an alternative…. Wow Bjorn, a must have pedal! I was thinking back the other day, and realized that my very first pedal, (It was more like a large Tank!) was a univox Univibe. I learned bridge of sighs, and being a new guitarist, was always proud that I could sound exactly like Trower with the one pedal, and an old Silvertone tube amp, and my lovely first guitar, an SG copy, called an Ampeg Super Stud. Wish I still had both the guitar, and the Univibe. I will have this peda; soon I hope! it would be nice to a/b this pedal with moon vibe or similar. Bjorn, Thanks for the review, it sounds like a great pedal but the price tag was a bit of a shocker. It still puts it in line with the other boutique vibes…guess I had hoped for a $200 price tag not a $300. If I didn’t already have a great Sweetsound Ultravibe II, I might consider the Dry Bell though it is nice to have the separately located large speed knob for on the fly foot adjustment without having to add an exp pedal. Hi bjorn! Great review as always. How is it compared to the mojo vibe? How is the strength of the throb on slow settings?? This is where I find most vibes fall short. The only vibe I’ve ever found that does that well is the FoxRox Aquavibe, and with the exemption of the Vibe Machine, I have tried them all. Hi Bjorn, nice review! That is definitely a nice sounding vibe. I have been in the market lately for a new vibe so this is a timely review as well. I have a Fulltone Dejavibe 2 (the huge one with the footpedal) and although it’s a great vibe, it is rather large for my pedal board. I have been looking at the newer/smaller chassis MJM sixties vibe for a little bit but now I am intrigued by this pedal. How would you compare it to the MJM? sounds great ! a bit pricey though…. whats a good budget vibe?